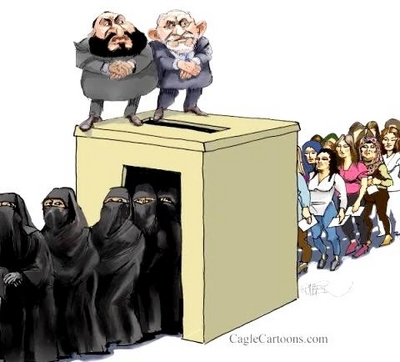 This caricature, which first appeared on CagleCartoons.com, has been making the rounds on the Arabic blogosphere, and points to how democratic elections are serving to Islamize Egypt: average women enter the ballot box—"overseen" by the Muslim Brotherhood—only to emerge thoroughly veiled, thoroughly Islamized. 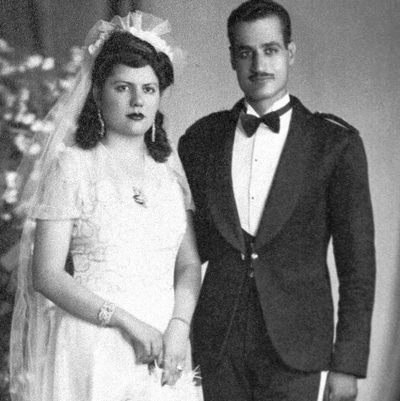 Speaking of veils and the Brotherhood, here's an interesting video of Egyptian president Gamal Abdel Nasser (1956-1970), showing just how much times have changed. According to Nasser, the very first demand of the Brotherhood leader was for the hijab to return to Egypt, "for every woman walking in the street to wear a headscarf." The audience erupted in laughter at this, then, ludicrous demand; one person hollered "Let him wear it!" eliciting more laughter and applause. Nasser continued by saying he told the Brotherhood leader that if they enforced the hijab, people would say Egypt had returned to the dark ages (to more laughter), adding that Egyptians should uphold such matters in the privacy of their own homes. Half a century later and none of this is a laughing matter: the hijab, if not the full burqa, is commonplace in Egypt, even as the Muslim Brotherhood—who for decades were banned and imprisoned for trying to return Egypt to an Islamic dark age—are now poised to govern the nation, all under U.S. tutelage. not that he released these groups [Muslim Brotherhood] from the prisons after Gamal Abdel Nasser had incarcerated them; but rather for giving them the green light to work in all fields of Egyptian society, thinking he would use them to get rid of his Socialist and Communist opponents. So he permitted them to work in trade unions, school unions—giving them every opportunity to hold official positions [Emphasis added]. In other words, Sadat's great mistake—which cost him his life—is that he conferred a degree of legitimacy on the Muslim Brotherhood, thereby allowing them to worm their way into Egyptian society. Such is the way of time: left unchecked, what was once ludicrous to suggest—for instance, the Brotherhood's 1953 request "for every woman walking in the street to wear a headscarf"—slowly and gradually becomes part of the culture. It is for this reason that Sharia poses a threat to the West—not because it will be imposed on Westerners, but rather because, little by little, decade after decade, aspects of it may gradually worm their way in. Raymond Ibrahim is a Shillman Fellow at the David Horowitz Freedom Center and Associate Fellow at the Middle East Forum.